A look at the online newspaper service and the shortfalls of the website as it is in 2014. Paper.li is a cool website which you can use to gather content from lots of different sources and create a digital newspaper. It can be used to help promote your latest content. I have recently been looking at new ways to spread the MoneyCortex brand name further around the web. One of those I like is content curation. There is too much news for a small business like ourselves to report every story that breaks, but it is good to still share an opinion and share other peoples stories we don’t cover. For this content curation services are perfect. And our brand will be seen in other areas of the web. That’s a win-win situation. I spent one day trying out Flipboard, Scoop.it, and Paper.li. The end result was that my favorite was Flipboard, second Scoop.it and third Paper.li. I felt like Paper.li lagged quite a bit behind the others in what I was looking for. I tweeted about it and was politely asked to give them feedback with my thoughts. So I have, and felt that once I’d written everything it also made for a good blog post that other users might want to read, so here goes. These are only my opinions, being a new user I’m sure some points are just me being a newbie, but everyone is a newbie once to services like this and so others may have a similar experience. I hope actions can be taken, as it will benefit us all if the owners improve the website. Don’t annoy me the first second I land on your website! I would like to click this button please. 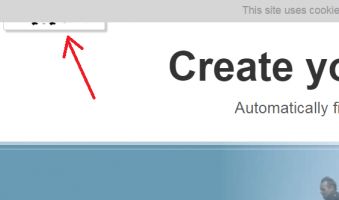 To start off when you land on the website the cookies notice is over the top of the menu and sign-in buttons (pictured). It looks annoying and seems sloppy, why is it not just at the bottom of the browser instead. That is an instant niggle as soon as I land on the site, not a great start. Simple sign-ups can lead to low-quality users. I chose Flipboard to be first in my rankings partly because of their sign-up process. Because you have to install their app on your smartphone and sign-up, that will discourage a lot of spammers and those who only use easy tactics to get links to poor quality websites. It is too much effort for them to bother. This will keep the quality of the community good. Whereas with Paper.li the sign-up is a lot easier with just a quick Facebook or Twitter account login and you’re done. For the spammers this is perfect. They can sign-up in no time, create any old crappy paper and include the RSS feed of their site. And I felt that this showed whilst I used Flipboard and Scoop.it compared to Paper.li. Having said that the Scoop.it signup procedure is similar, but for whatever reason it doesn’t feel like there is as many members on there for the wrong reasons (IE just to get links). I understand as a company Paper.li say they “strive for simplicity”, but sometimes it can bring down the quality of the product. It doesn’t really feel like much of a connected community. The other 2 sites felt more like a community to me. Although you can add other peoples papers as favorites and see whats ‘currently buzzing’ it didn’t have the same feel. I like the ability to add my brief opinion when I can. I do appreciate the Paper.li site and the others are all slightly different. The curation aspect of Scoop.it I loved and my gut feel early on is that I will probably use that website most long-term. Being able to put together something that people can subscribe too, but also curating the news with my own little opinion on each story is great. I feel an aspect like that is lacking on Paper.li. What are the preview images of newspapers? They don’t look very encouraging to click on. One thing I was unsure of too when looking at different papers by searching, was the preview images. I couldn’t work out if they were images chosen by the creator, or an image from one of the stories or what. Because plenty don’t have them, they simply have the large blue background with a ‘P’ in the middle (pictured). But I want to be able to create a specific logo for the paper that shows there every time. One that looks professional and gives searchers more reason to click on it. You should not be able to have the same newspaper name as someone else. This seems silly to me. I hate how newspapers can have the same name. When I type ‘science’ in to the search box I instantly find about 20 papers all called ‘science’. It is not a pleasing result, I don’t get the desire to click on any of them! But if I search ‘science’ on Scoop.it and click on the ‘topics’ I see an array of different choices. And although Paper.li call theirs ‘newspapers’ and Scoop.it call theirs ‘topics’ they are essentially the same thing. A group of news stories from different sources. So as a user I am using them for the same purpose. But using Scoop.it is a million times more enjoyable and obviously makes me want to keep using it, unlike Paper.li where I just hit a brick-wall of unimaginative, same-name copycat papers. It looks like Stephen Fry gave up on the website. Whilst researching before joining I stumbled across that Stephen Fry was a user, only to be disappointed when I found out his newspaper sits with no content on it. One of Britains finest people a member and yet it appears as if the paper is inactive and there is no message of if it has stopped or what. Seems like someone like that as a member is a big bonus, but yet if he has sacked it off it makes me wonder why? Autoposting is annoying, I think it should be strictly for those who have paid. I strongly dislike this feature. 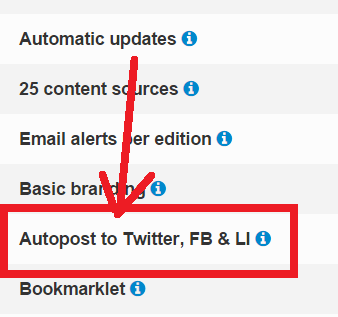 I’m not a fan of the ‘autopost to twitter/facebook’ feature, at least not for free members. I think autopost should only be for paid members. Like I said earlier about the issue of people signing up just to get links, many of those in that mindset will be autoposting, and personally as a Twitter user, if I follow someone who is constantly tweeting trying to send me to their newspaper I unfollow them. No problem with people sharing their paper, but not every single day, if I want to read it everyday I will subscribe thanks! It’s a shame the pro features don’t offer more promotional type benefits. Looking at the pro features I also thought it was a shame there was no kind of promotion type benefit on the site. Such as pro users papers showing up in search results before free members. If I am to pay for the pro service I also want to be sure there will be something in there that will get my paper more exposure within the community. I know you can have your own ads to make money from it, but I wouldn’t want the revenue from my newspaper, I’d rather get more readers. We already publish over 200 million articles a day for our users. But nothing about engagement. How many readers and subscribers actually engage, how many of those 200 million articles get clicked on? That’s my two-penneth. For now. As I said at the start I have only just started using the website. But in one days use I had all these grumbles. I hope some improvements can be made. It is a popular website, but one that could certainly improve. Let’s see how it continues to progress over the coming months and years.